This season is the BEST TIME ever to invest in family memories that grow around a custom outdoor patio and stone terraces that transform your backyard. For over two decades GA Landscape Design has been designing and building luxury outdoor living spaces and stone terraces in the New Jersey area. Do you have terrace or patio idea to extend the warmth and pleasures of your home to the great outdoors? Do you need more patio space for entertaining? Our expert designers will create a design according to your needs and transform your yard into your favorite getaway spot. Working with the design and style of your house and the layout of your outdoor space, plus anything else you’re looking to add to enhance your outdoor space (such as a custom in-ground swimming pool, a waterfall, an outdoor kitchen, etc. ), whether you require a tranquil retreat for quiet evenings or family-fun gathering spaces, we’ll design and build a unique custom patio or stone terrace that complements your lifestyle. 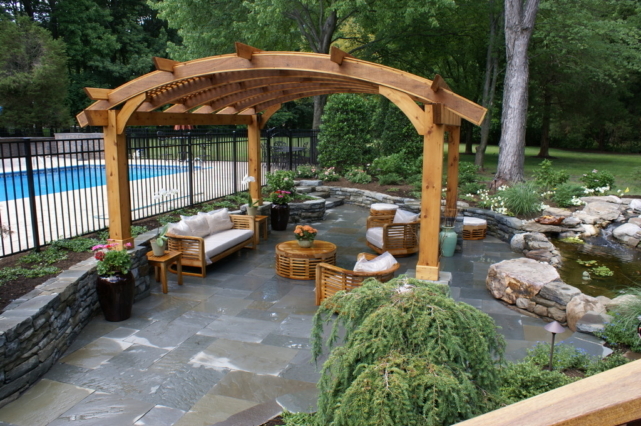 Our hands-on approach and attention to detail will transform your backyard into your “Dream Backyard Oasis”. From designer details, to custom outdoor patios and stone terraces to luxurious gardens with intricate lighting – GA Landscape Design has the experience and talent to bring your dream to life!